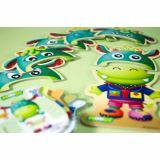 This game will help children identify the emotions and disclose their feelings. They will find out why we feel happy, sad, surprised, bored, satisfied, angry, disgusted, frightened, etc. Watching Moogy will teach them a little about themselves. This item also has a free digital component found on playminiland.com where you may find lesson plans and downloadable/printable activity cards. You may also access an online game that complements this toy. Giant stacking and nesting game formed by 10 progressively sized cups. The largest cup has a perforated cover with the silhouettes of different shapes. Included in the set are the 4 shaped blocks to match and insert through the cover. 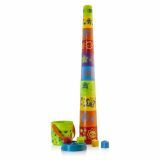 Promotes eye-hand coordination. 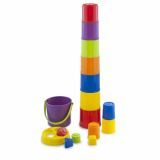 Small kids will love ordering and stacking them up to then knock them down, which is what will amuse them the most. All the pieces can be stored in the big bucket with handle, which occupies minimum space. This item also has a free digital component found on playminiland.com where you may find lesson plans and downloadable/printable activity cards. You may also access an online game that complements this toy. 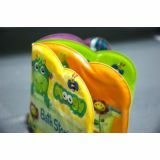 This entertaining waterproof book develops a child´s imagination while taking bath or in any other aquatic situation. Moogy teaches kids the importance of correct personal hygiene and provides them with new sensory sensations. This item also has a free digital component found on playminiland.com where you may find lesson plans and downloadable/printable activity cards. You may also access an online game that complements this toy.